The South Bay has rapidly turned into a Japanese food mecca, with the likes of yakitori-turned-izakaya Bincho, etc in the area. I haven't been there much. Why? It's really not that far. There should be no reason! So why not go and hit em all, food marathon-style? I was joined by Food Destination + 1, Pepsi Monster, the nascent Kung Food Panda, Mattatouille, Choisauce, Teenage Glutster, and Rumdood. Our first stop: some okono and monjayaki at Gaja in Lomita. Which one do we want to order? Do we want to cook 'em ourselves or have them prepare it for us? Luckily Food Destination(a.k.a Gilded Palate)'s Japanese gf was there so we could order properly. 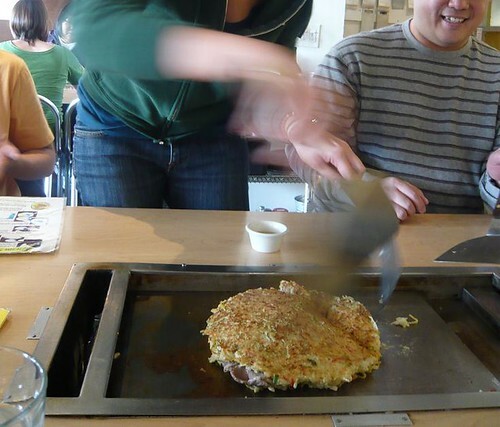 Look at her skilfully whip out our okonomiyaki on the teppan! 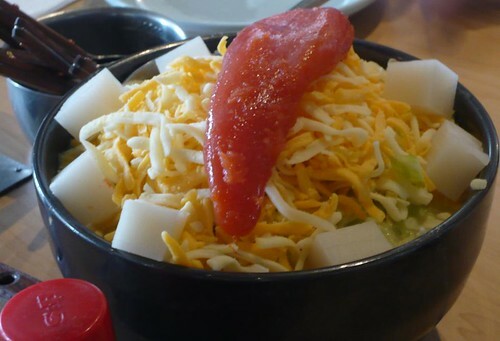 This time we also had something I haven't tried here before, the monjayaki. We ordered the one with mochi and spicy roe. 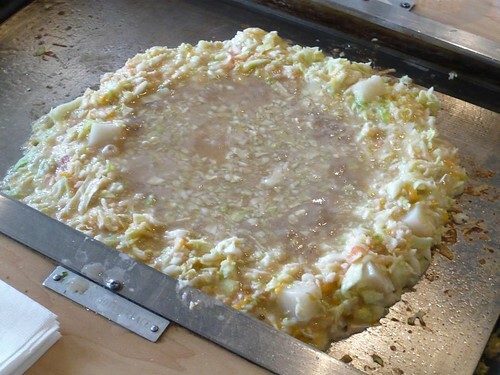 You also grill this monjayaki on the teppan, but it doesn't quite solidify like the okonomiyaki. Okay, you got me, I just love eating it with the cute lil spatula they gave us! 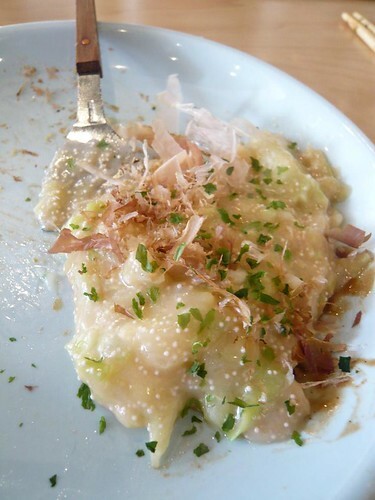 The monjayaki might look weirdly gooey and runny, but it's actually a creamy mochi-like concoction that's pretty flavorful with the spicy cod roe. 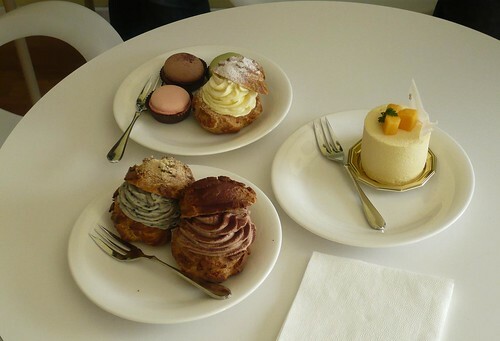 We had almost everything, including their popular cream puffs (popular because Mr J Gold raved about it) - all three flavors: Chantilly cream, chocolate, and sesame. 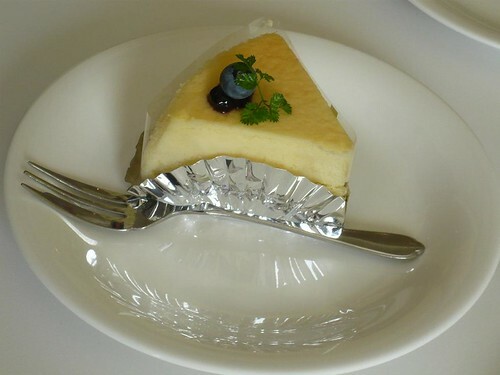 One of our favorites was the souffle fromage - which is kind of like the love child of a rare cheesecake+souffle. Light and fluffy, Food Destination claims it's like eating clouds. Agreed. A sweet, cheesy cloud. 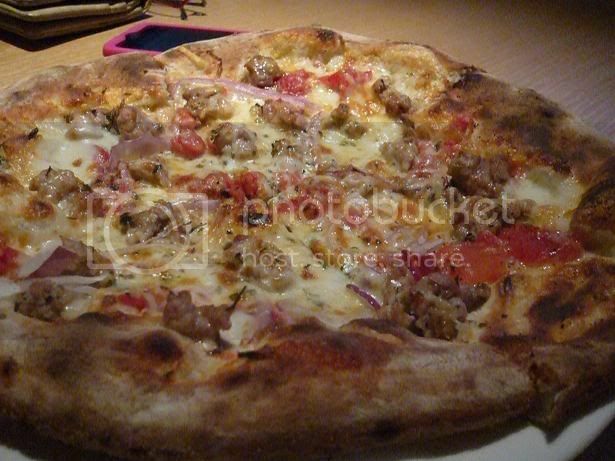 In the meantime, you can read about it on Food Destination and Pepsi Monster's blogs. La Casita Mexicana was an eye opener. Thanks to Teenage Glutster, I was included in the dinner that the two chefs of La Casita, Jaime and Ramiro, had planned for a number of bloggers. 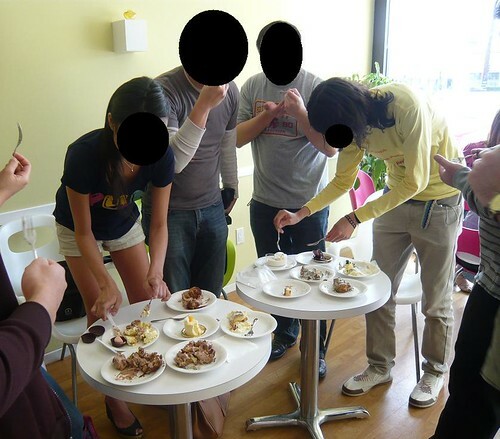 We were joined by Pepsi Monster, Food Marathon, Food GPS, Pleasure Palate and other members of her dining group, Oishii Eats, Eat Drink & Be Merry, Professor Salt and Will from FoodDigger. 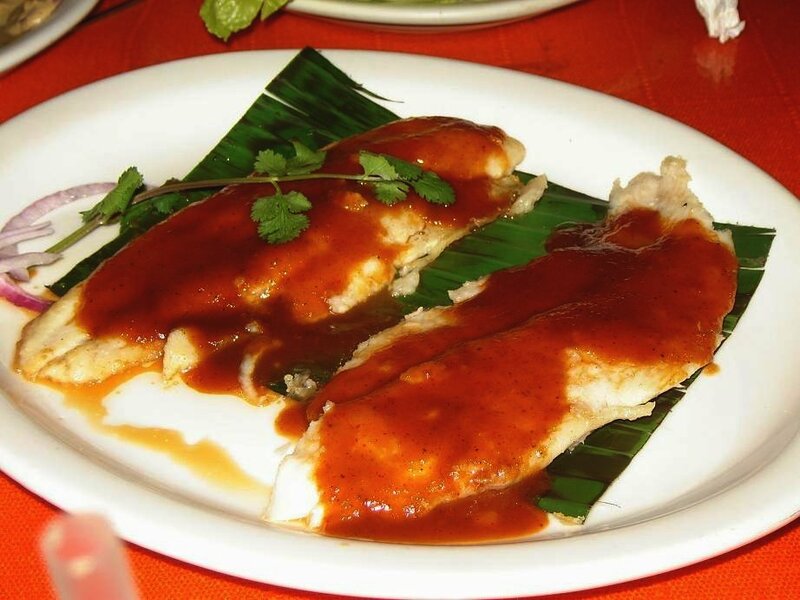 Jaime and Ramiro's mission is to educate Americans about Mexican food. 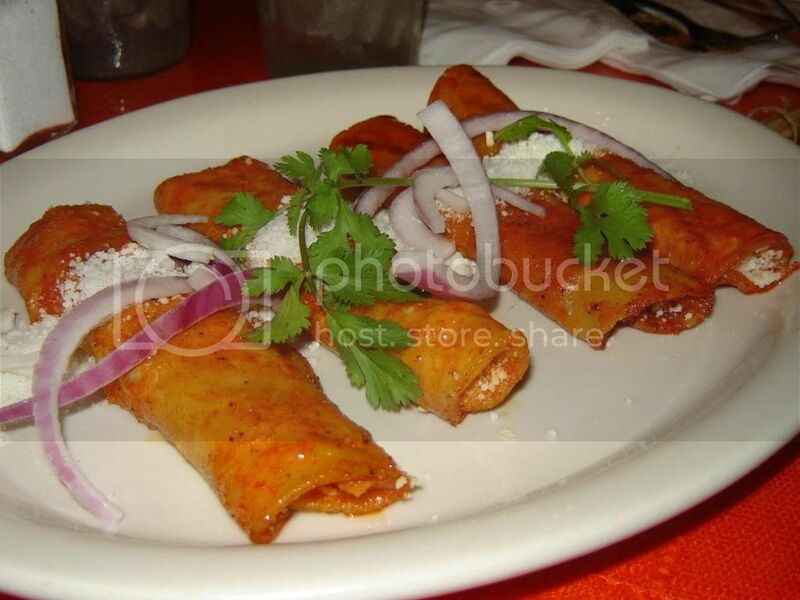 Authentic Mexican food. And no, it's not just tacos and burritos and quesadillas. 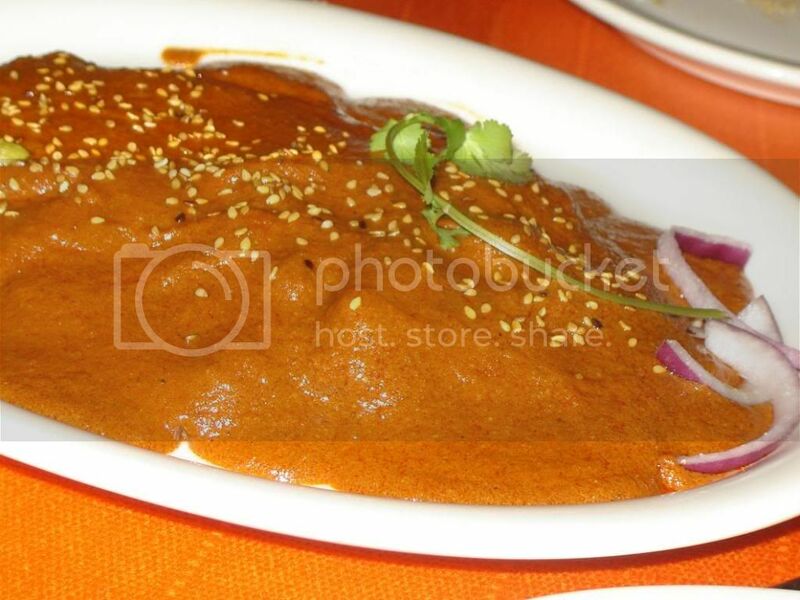 This city has at least seen some mole, but there are so much that we have not really been exposed to, as this meal will attest to! 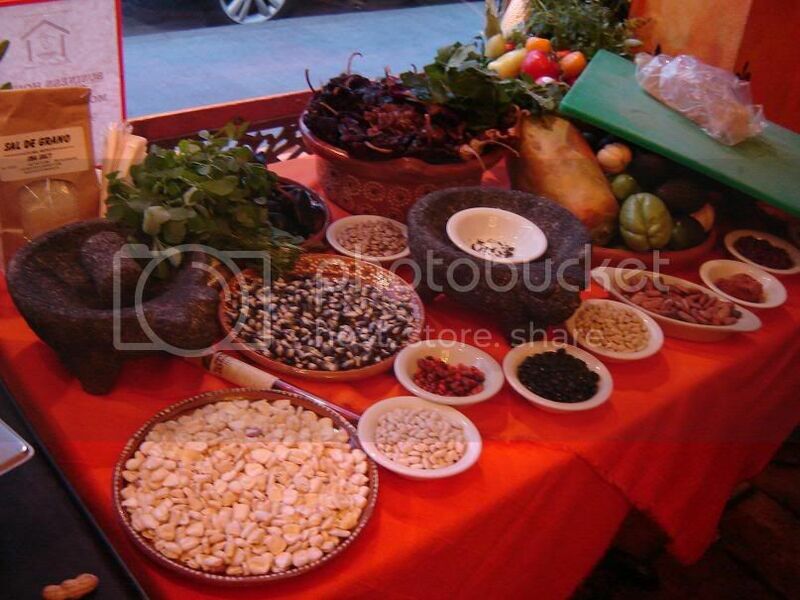 Jaime and Ramiro set up a table filled with the various ingredients they will be using that night, including numerous varieties of beans and chiles! 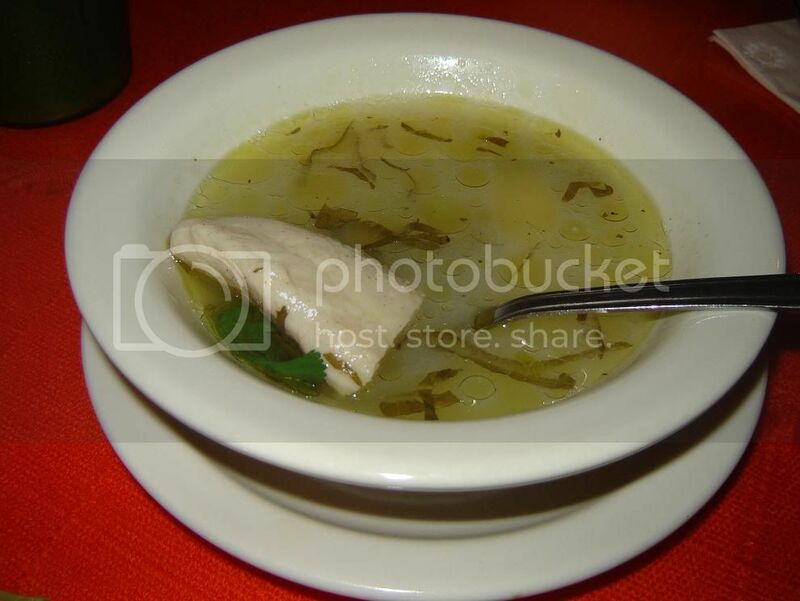 White fish soup with hoja santa. It's been a while since I've encountered hoja santa in the US. 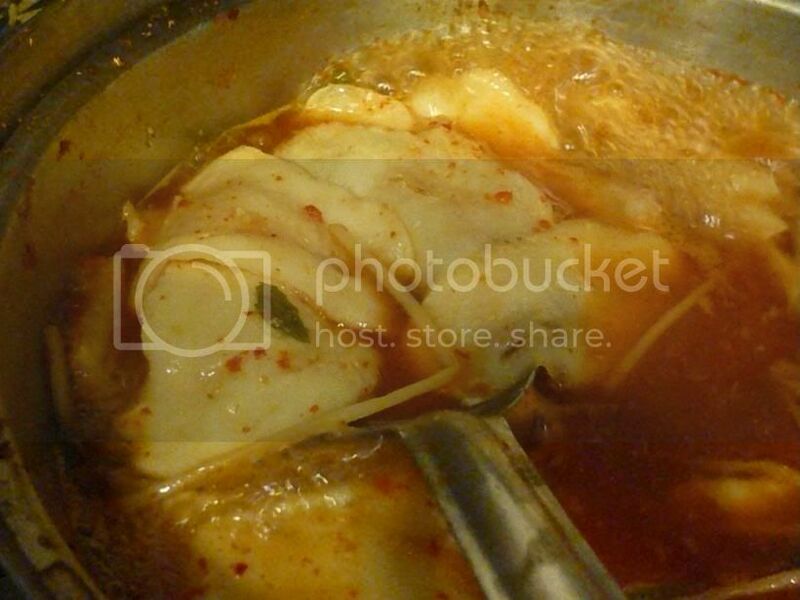 Nicely spiced soup (some said it is reminiscent of tom yum soup) and the fish is moist and tender. 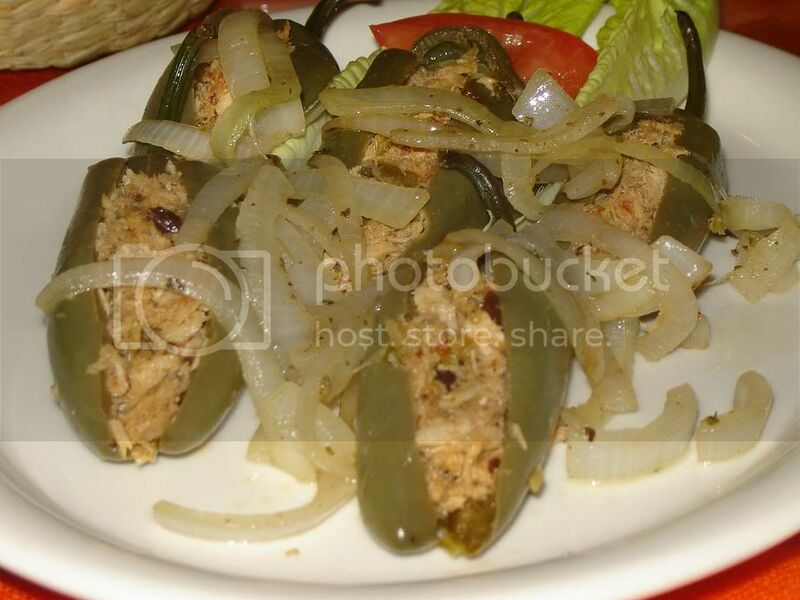 Although I've had stuffed peppers before I've never had one filled with tuna. Queso Azteca: a blend of 4 cheeses, mushrooms and cactus strips. 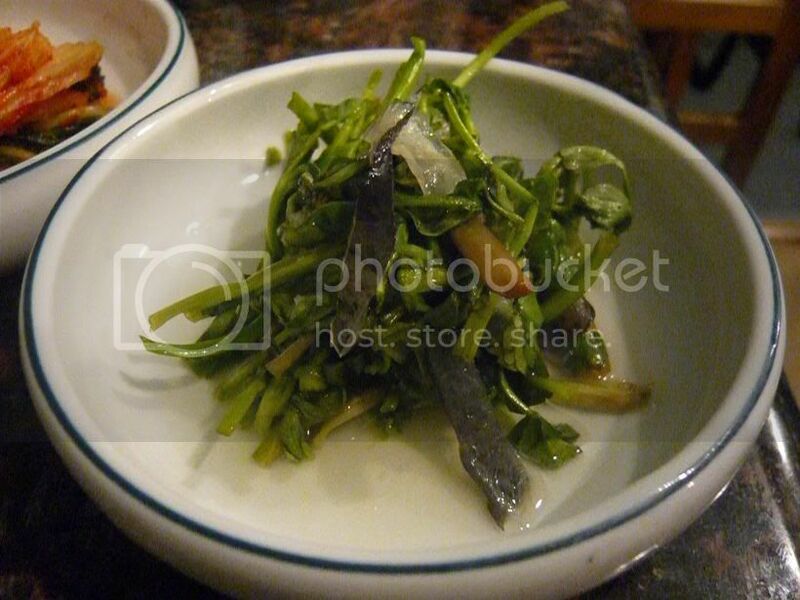 Definitely my favorite, and perhaps also most interesting dish, of the night. 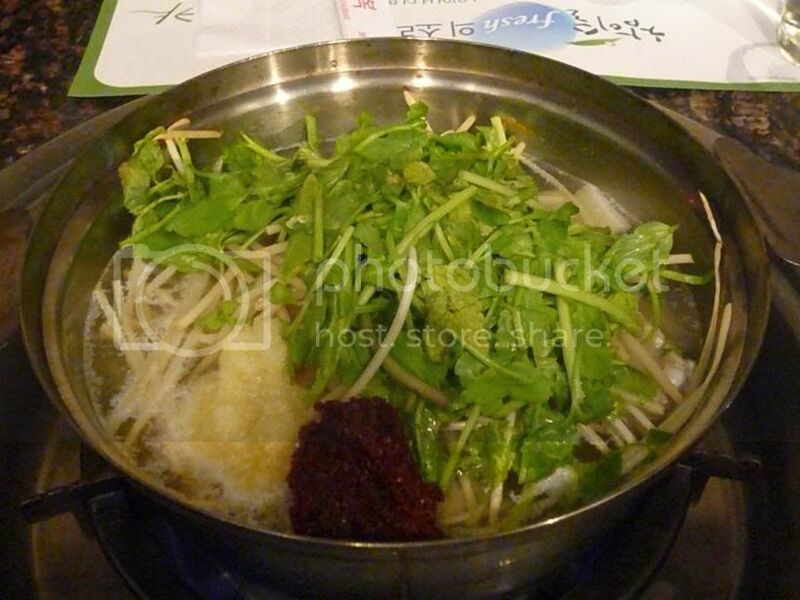 Full of flavors, especially with the mushrooms and slightly spicy cactus strips, and had a very interesting texture. 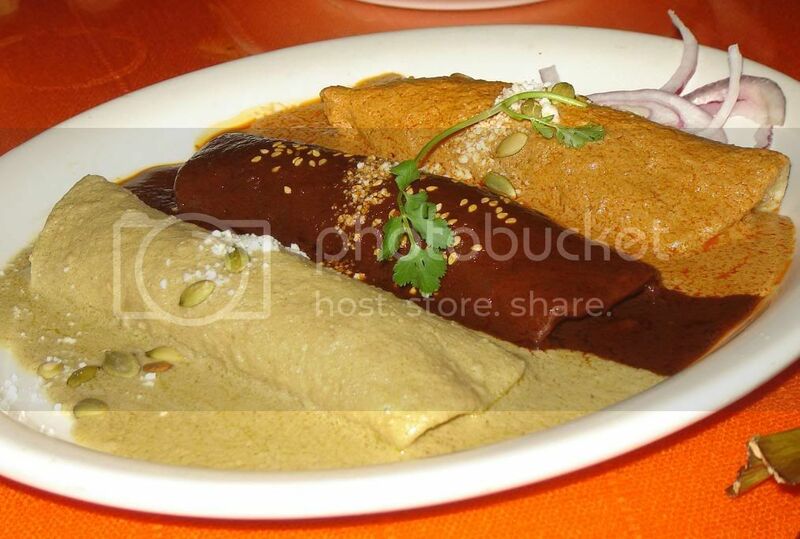 The 3 different mole sauces: poblano, pepiano verde, and pepiano rojo. 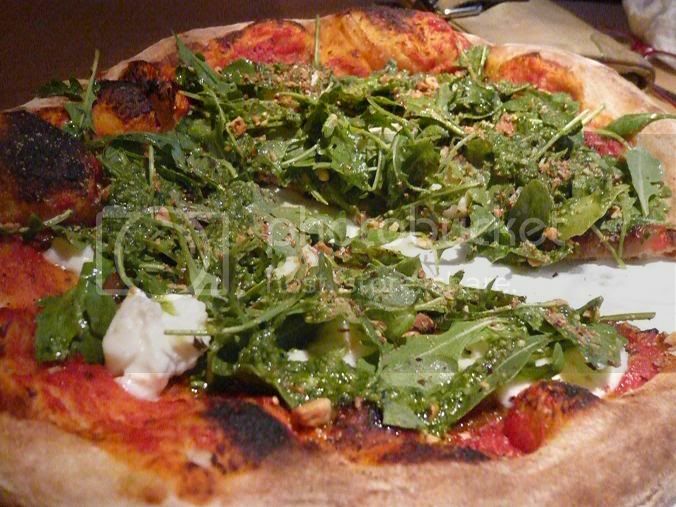 My favorite: The pepiano verde. I think. Hmm. They were all so good. Corn fungus eh? As Michael Pollan pointed out, we Americans loove our corn (too much even!). 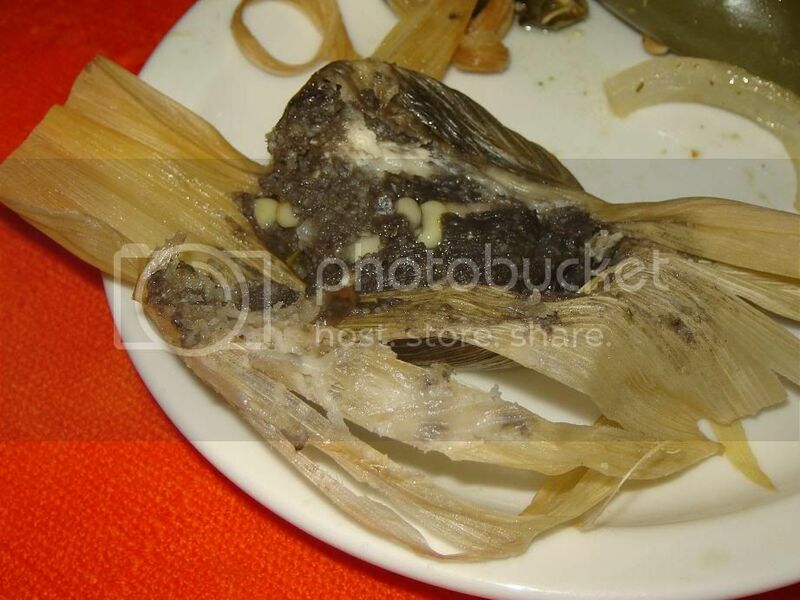 And apparently corn fungus is a delicacy and quite expensive in Mexico. 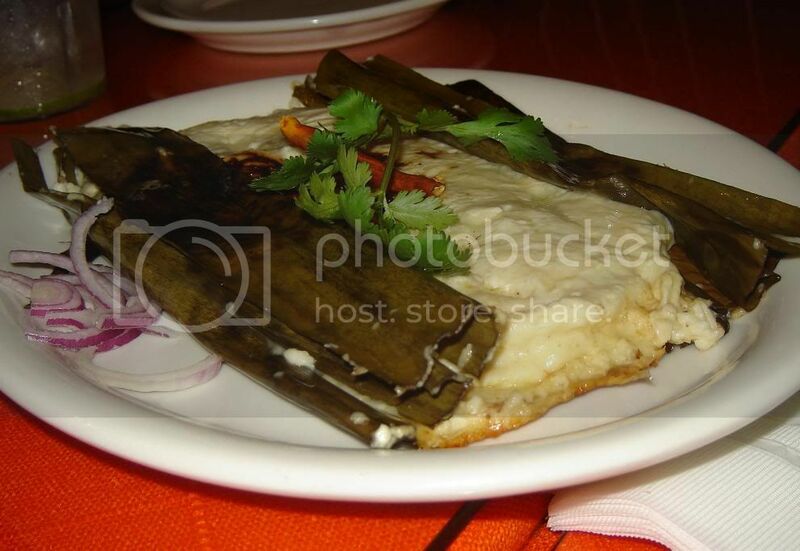 This gave the tamales a nice earthy flavor. 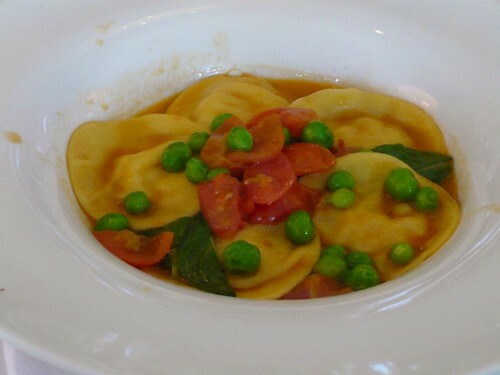 This simple dish was delightfully delicious. Apparently they lightly dip the tortillas in hot oil and then chile. The chile flavor was perfect for the dry, crumbly Cotija cheese. Be careful, this is like one of those addicting snacks ... If 15 or so more courses weren't on the way and I wasn't sharing with 4 other people, might've kept eating this. The first time I've had white mole! I didn't know they use white chocolate also. 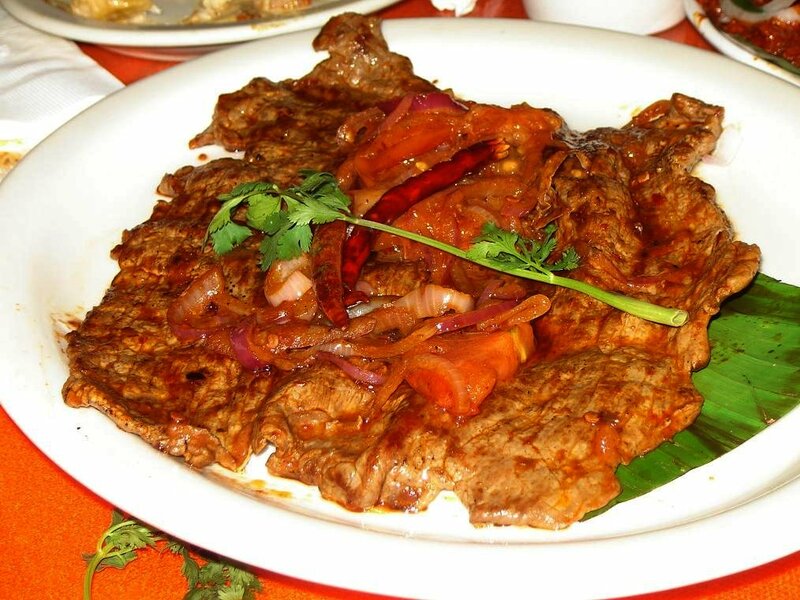 Cecina with chile japonese : thinly sliced beef cookd with a very hot chile. Reminiscent of a beef jerky, this is full of flavor and slightly spicy. 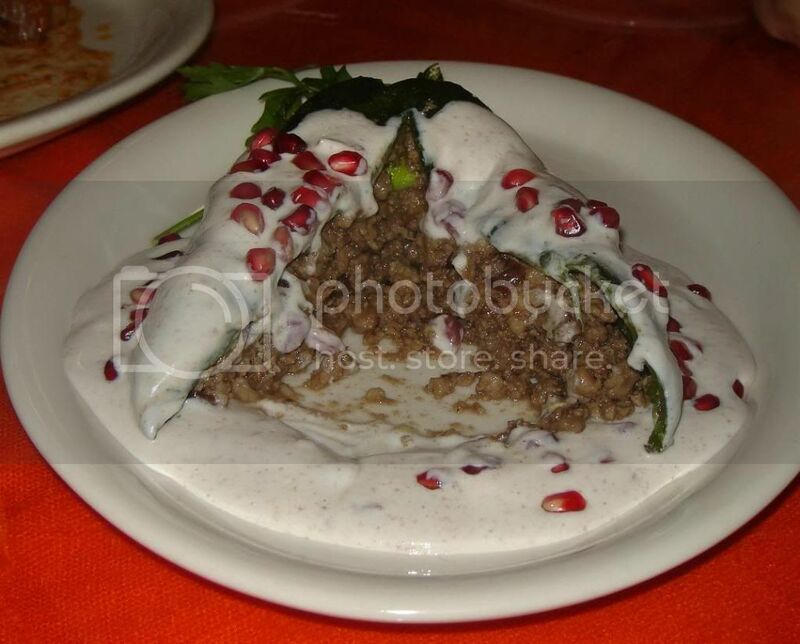 Chile en Nogada (Chiles in Walnut sauce) - a specialty of Puebla. 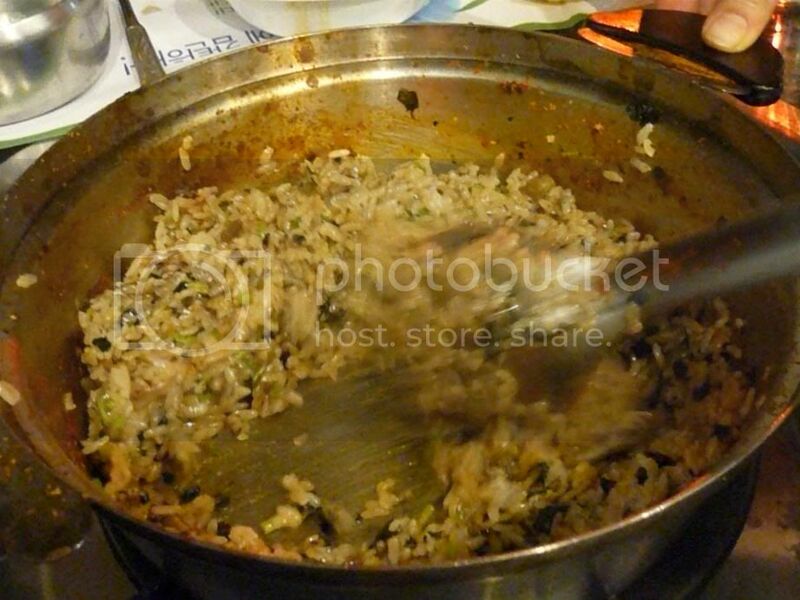 According to Cecilia Fabulich, this dish is apparently typically served around Christmas time(?). The colors are again those of the Mexican flag, but also rather Christmas-y, aren't they? 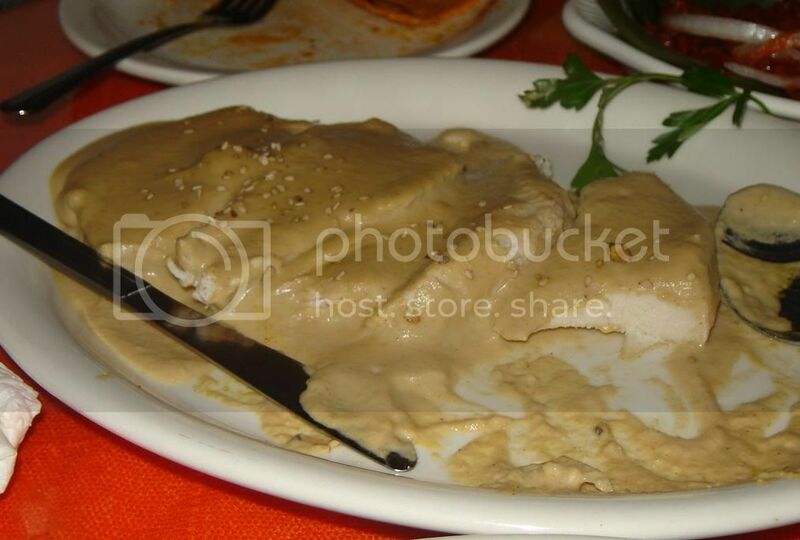 An interesting and almost dessert-y dish due to the creamy walnut sauce. Nice crunchy churros, and the caramel filling was not overly sweet. 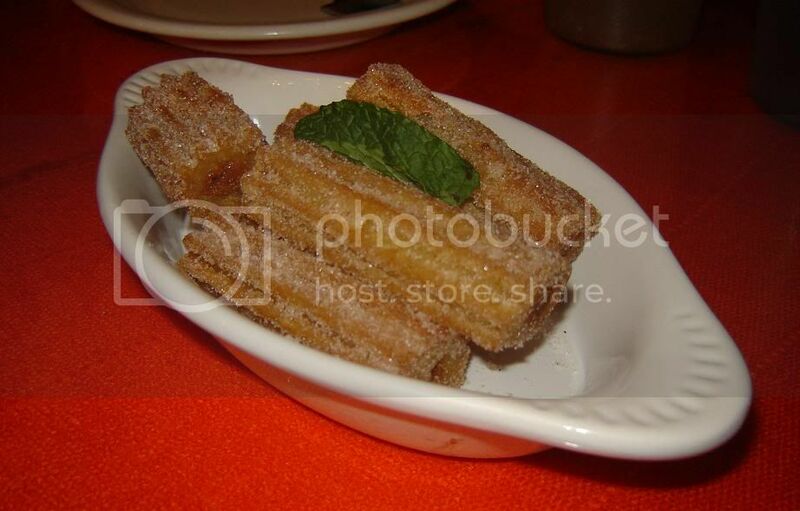 This blows any of those Disneyland churros out of the water. 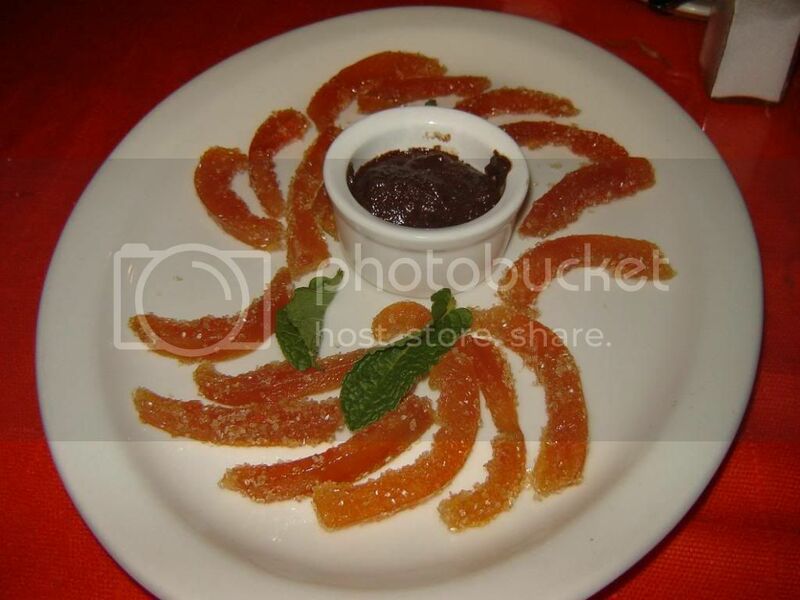 Mexican chocolate paste with crystallized grapefruit. Chunky, rich, and slightly spiced mexican chocolate paste. Perfect with the candied grapefruits. 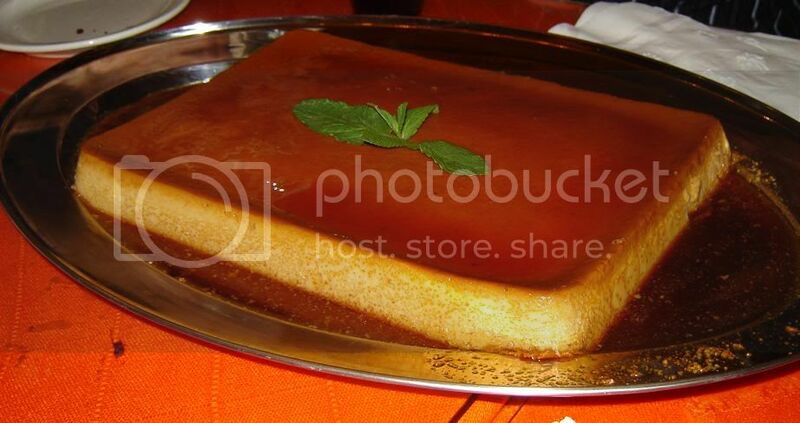 To end the night was this giant sheet of flan, too much for 20 people, especially at the end of the 17/18- course meal! Apparently they also had the zucchini flan floating around. I guess I was too full to catch and grab it. Thank you Teenage Glutster for including me in this amazing meal, and especially to chefs Jaime and Ramiro who had put so much care into everything. The best Mexican meal I've had, by far. 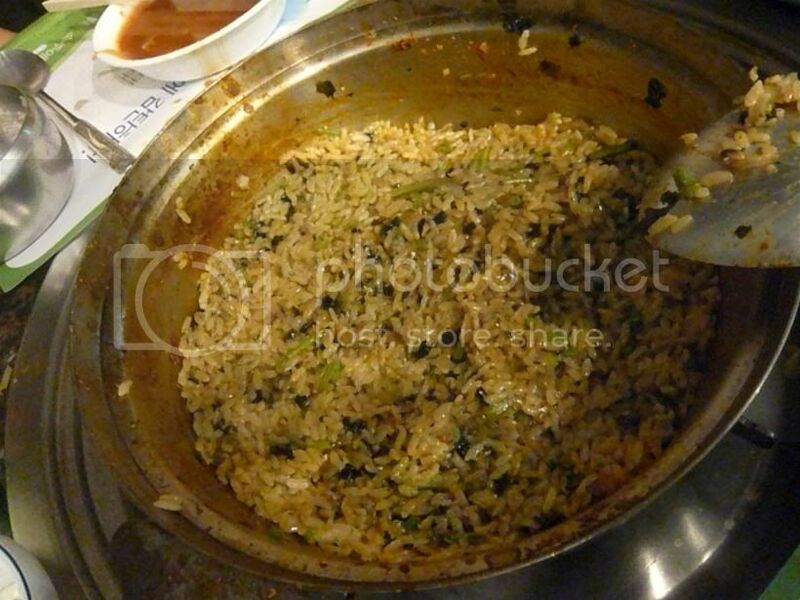 Read OishiiEats' review here and Teenage Glutster's here. Join us for a taste of the world from 4:30 - 5:30 PM! 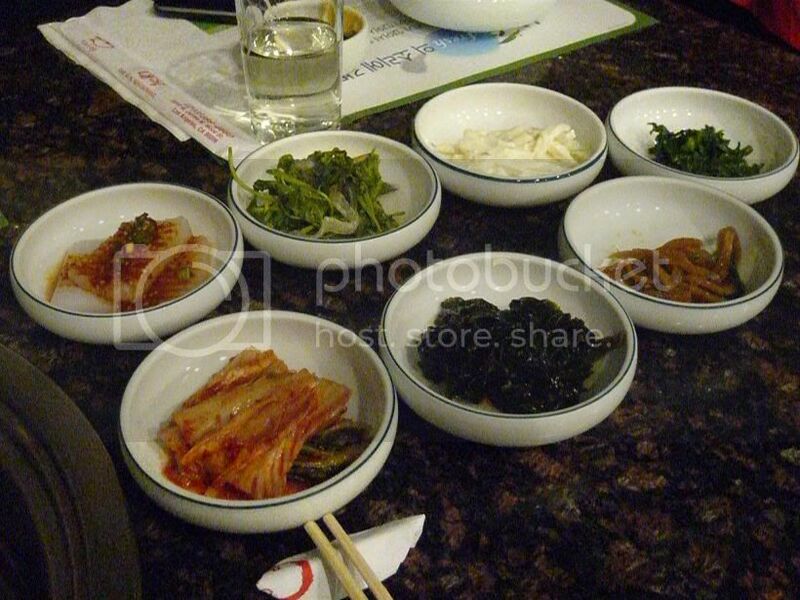 For just $3, sample foods from China, Hong Kong, India, Indonesia, Iran, Italy, Korea, Malaysia, Romania, Thailand, and Turkey. After eating, stay to see traditional dances, hear exotic instruments, and view colorful fashions from around the world. Culture Show is free, beginning at 5:30 PM. Food and performances provided by Caltech student clubs. And, most importantly, the map! The entrance is closest to Del Mar Ave and Chester, and you will also be able to see the fair if you're driving on Holliston. The Indonesian club will be serving kue lapis and beef rendang. See you there! 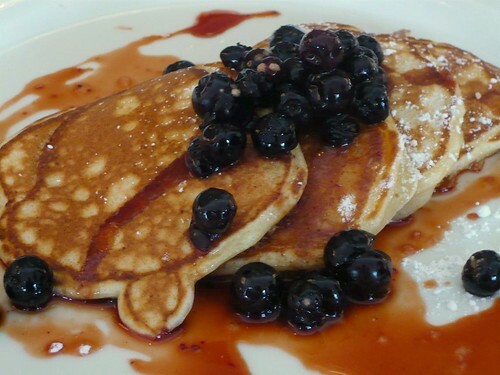 Feeling sinful, Cecconi's Ricotta Hotcakes sounded like the perfect solution to Easter Brunch. When I called they said they were booked until 4 PM but walk-ins are welcome at the bar. So off we went. The bar was almost empty when we arrived (11:30 AM ish) and there were quite a few tables empty, actually. Anyway. We were seated without a wait. 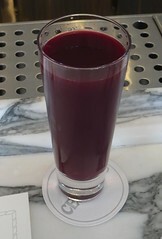 With no drink menu on hand and sitting at the bar, I just asked my server/bartender if they had fresh squeezed blood orange juice on hand. The answer was YES! A big glass of fresh (but pulp-less) blood orange juice - $5. My god ... you have no idea how long I've been craving this! So good. There's no brunch for me without fresh squeezed OJ! And blood orange juice just takes that up a few notches. Amazing hotcakes! Fluffy enough yet retained some density due to the ricotta. The preserved blueberries actually tasted something reminiscent of dates, especially the 'syrup'. A much better alternative to maple syrup! I'll be getting this again very soon. The portions here were small (remember your size comparison up there are blueberries) but I thought the prices were quite reasonable. What's the point of spending a couple of extra bucks to stuff yourself ? 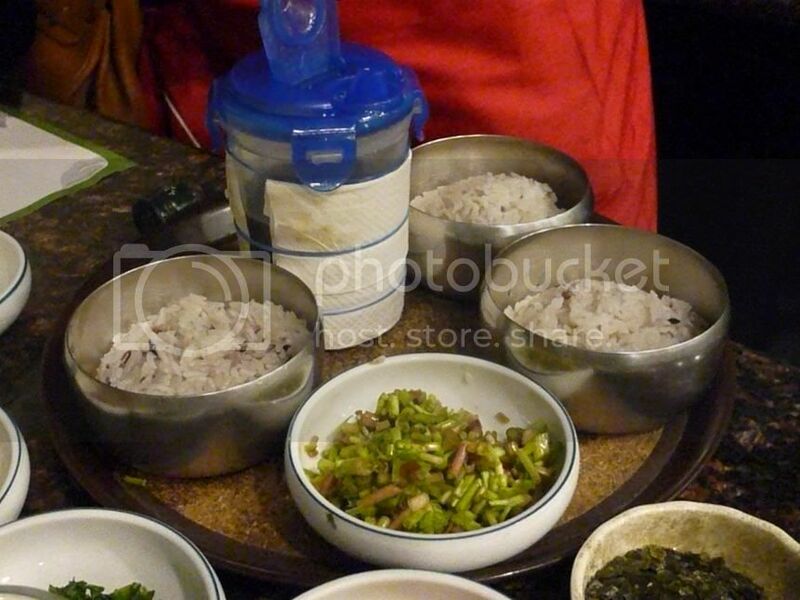 The size of the portions was just right for me ... to have two dishes instead! Not enough crab, but otherwise delicious. 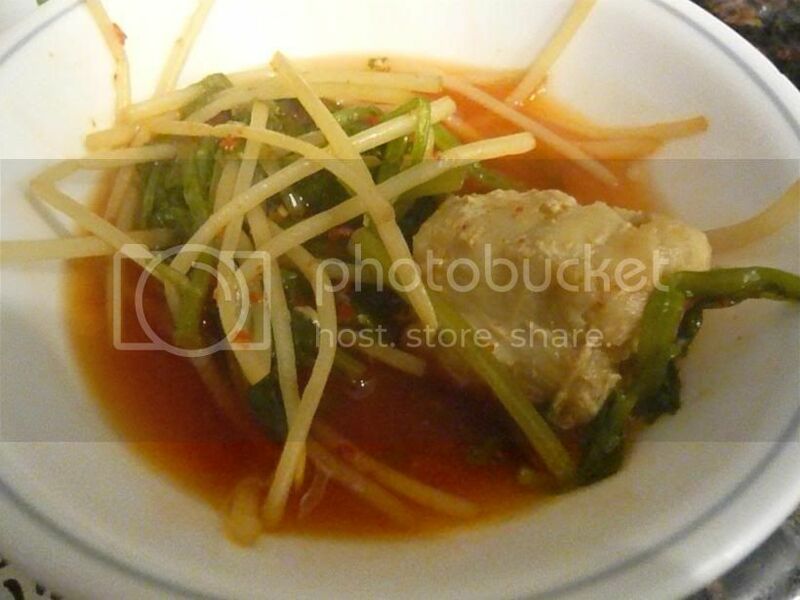 A nice and light tomato-based broth. 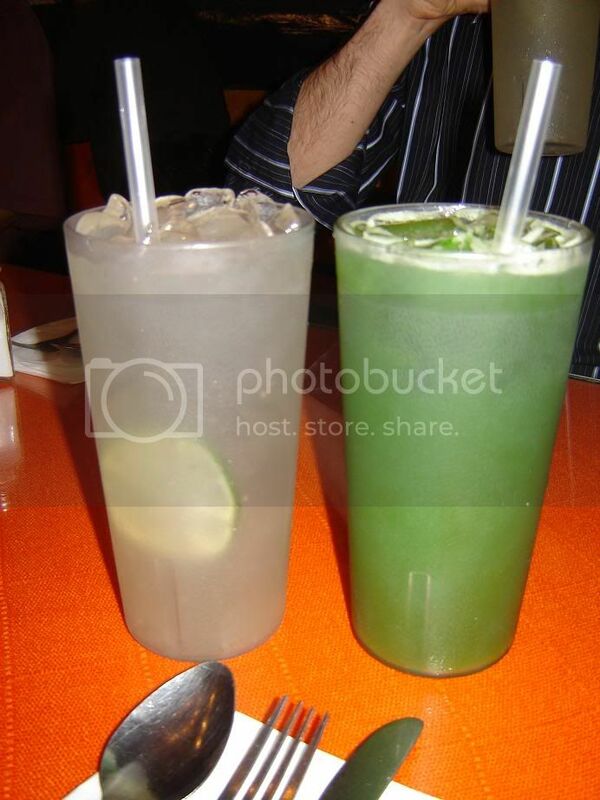 I loved the subtle kick that the mint leaves added. 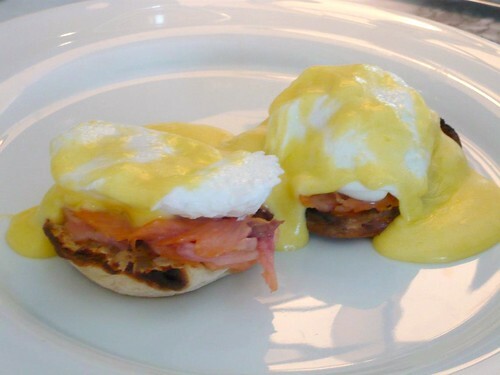 Interestingly Cecconi's poached eggs were more well-done than other places. This is probably an individual preference, but I liked it better less runny since I usually have a hard time eating the runny ones other than sopping it up with the english muffin. They're also pretty generous with the salmon, which is great. Our meal ended on a light note. 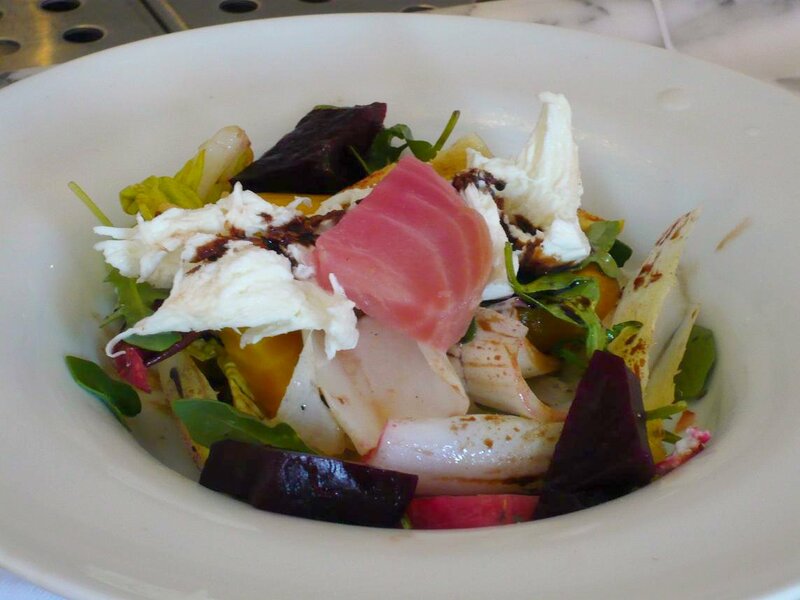 Chino Farms beets, buffalo mozzarella, and endives ($11). 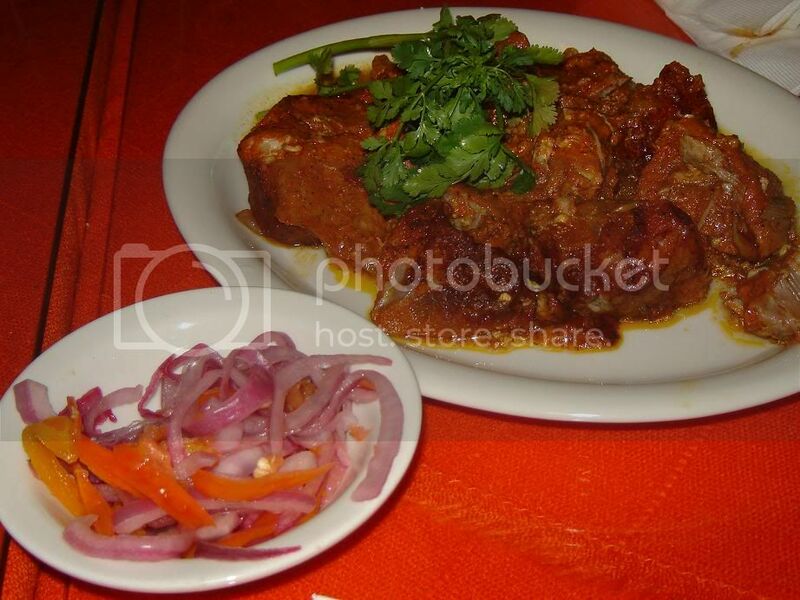 A very well done dish with great ingredients! I also loved the buffalo mozzarella in this dish. 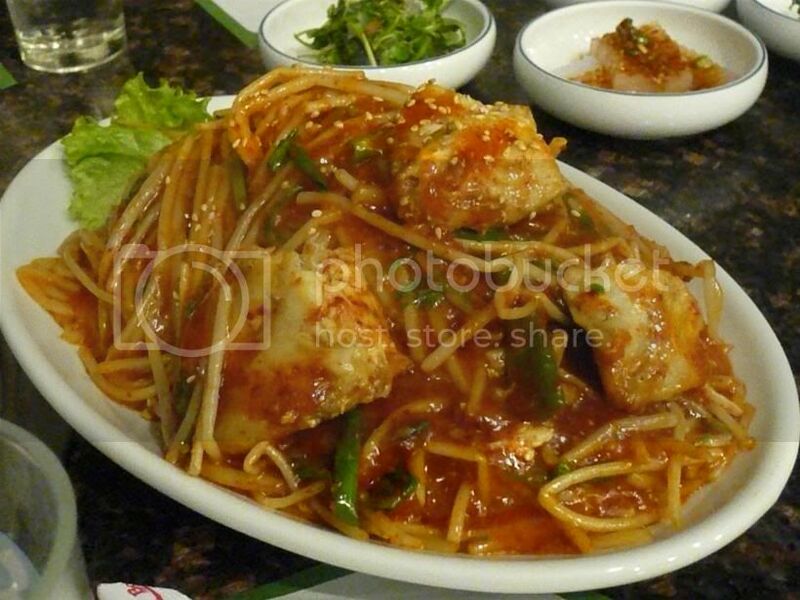 This might in fact be the best dish of our meal today. Do give it a try, it's light anyway! The stools at the bar were heavy and not the most comfortable. Doesn't matter. 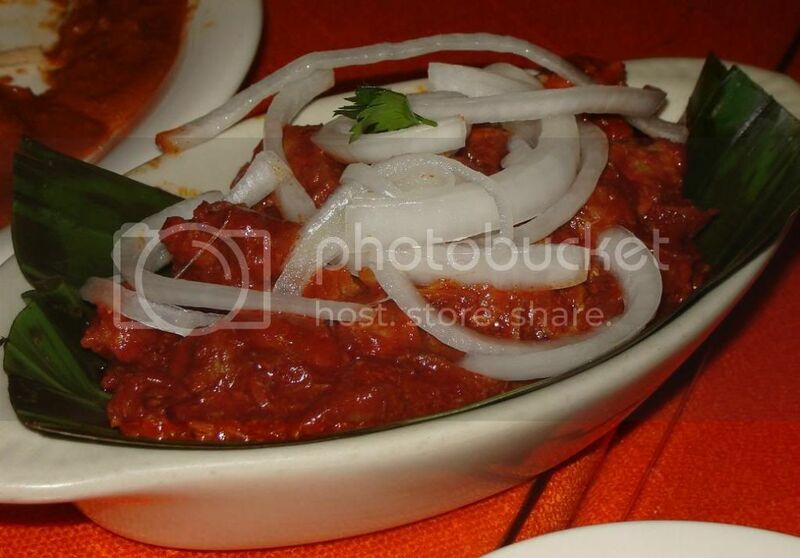 Food's great with great ingredients, prices are right. I'll be back.